1 week until Thanksgiving and what’s a Thanksgiving without cornbread?! Instead of risking a dry uninspired dish or drenching your bread in honey hoping to mask the dryness try making my Jalapeno Cheddar Cornbread Muffins. The sharp cheddar cheese gives these muffins a bite while the jalapenos create a pleasant boost. Want the secret to creating moist cornbread? Throw creamed corn into the mix. You can make this recipe in a 9×9 pan if you want, but why not make it fun with muffins?! They are automatically divided into the perfect portion sizes. Enjoy! Prepare muffin pan with muffins liners and non-stick cooking spray. Mix cornmeal, flour, baking powder, sugar, and salt in a large mixing bowl. Whisk milk, butter milk, butter, eggs, and creamed corn in a separate bowl. Add wet ingredients to dry ingredients and stir until thoroughly combined. Add jalapeno and ½ cup shredded cheddar to mixture. 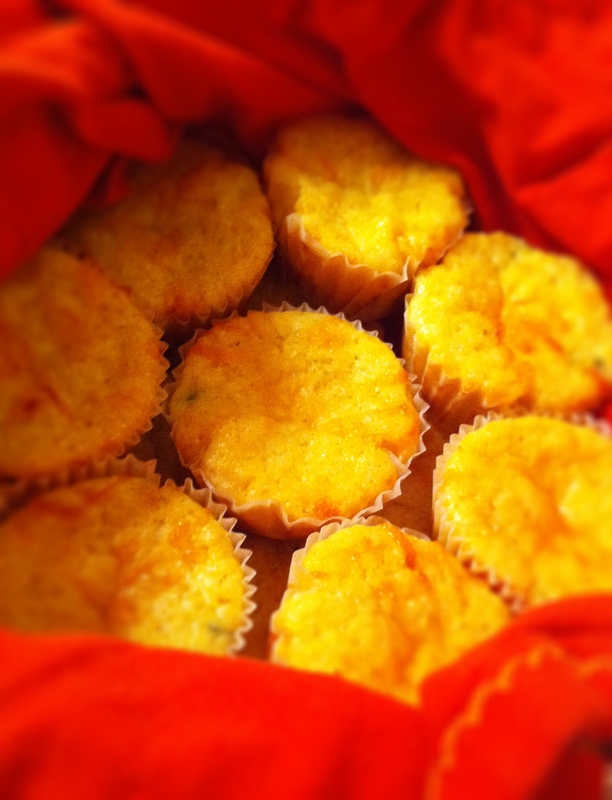 Pour mixture into prepared muffins liners and top with the remaining ¼ cup cheddar cheese. Bake for 15 minutes or until a toothpick can be inserted in the middle, removed, and clean. What do you think about doing a little Thanksgiving twist by adding dried cranberries that have been masurated in Chambord? Oh that sounds delicious!!! I like it!